March 11th, 2014 - Which is Best and Which do You Provide? Managers and employees are asked to do more, with less, now more than ever before. As a result, when it comes to forklift operator training, it is easy to slip into the mode of "regulation compliance." By providing the basic training recommended by OSHA liability is mitigated, but establishing a culture of safety in your operation will result in changes that go far beyond regulator compliance and reduced liability. This is just to name a few. Training is a never-ending process. Why? Because nothing is ever stagnant in a warehouse situation. There are frequent changes involving equipment, processes, personnel, products or facilities, and the list goes on. Each change requires training or re-training to make sure each employee can become familiar and comfortable with the changes. This rather ambiguous definition (#5) could mean anything from a change in the products you carry (depending upon how they are handled) to changes in how you store your products. So as you can see, having a once-a-year operator training day would not even provide your company compliance with the letter of the regulation, much less keep your facility operating at an optimal level as it pertains to safety and productivity. Let’s look at the differences in the pure definitions of teaching vs. training. Most traditional “training” programs are in-fact barely more than “teaching sessions.” In order to fully train, you must first start with the trainer. OSHA regulations regarding forklift operator training state: “All operator training and evaluation shall be conducted by persons who have the knowledge, training, and experience to train powered industrial truck operators and evaluate their competence.” This means the person you are relying upon to meet these standards will need more than a three-day class in operator safety training. He or she will need to have significant experience with material handling equipment and all facets of operation as well as the ability to express what he or she knows in a logical manner so that the material is effectively transferred to your operators. This is very important particularly if your goal is truly training, and not simply compliance. Create ownership at all levels. Whether it starts at a VP level or with your Safety Officer, each and every person must know the expectations and be proactive in bringing ideas and opportunities to improve safety conditions to the table. Regular meetings. These meetings should not only address new training needs, but also review of OSHA standards and the expectations of your organization as well. Safety inspections. Along with your employees, walk their areas and departments and provide them opportunities to point out changes and areas of improvement. When it comes to forklifts, daily inspections are part of the regulation, and you can find daily inspection forms on our Forklift Training webpage. Keep records. All meetings, attendees, topics etc… Have someone take notes and file them. Keep all training records in employee files for reference, and keep a simple spreadsheet handy of all training, what it covered, the date it occurred, and when refresher training will be required in the future. Make safety part of your culture. Posters, reminders on paycheck stubs, celebrating safety milestones, contests, t-shirts, hats and other awards are all small things you can do to permeate your organization with your safety mantra. As you can see, training is no accident. It must be carefully planned and continuous. 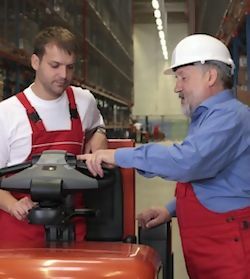 You can count on Toyota Forklifts of Atlanta to be a proactive training partner to be sure you and your employees are receiving the right training for the operating conditions of your specific facility. We have the experience with all classes of equipment as well as warehouse operations. Our experienced trainers ensure a training source that you can count on to get the material across in an effective manner. An ongoing training program will pay for itself in the long run. And since you look at your employees as family, ensuring their safety is just the right thing to do. Remember “train” your employees, don’t “teach” them, and the payoffs will be great…for everyone involved.